Last month Marine Technology Reporter had the opportunity to meet with Dr. Holly A. Bamford, acting Assistant Secretary for Conservation and Management for the US Department of Commerce, National Oceanic and Atmospheric Administration (NOAA), in her office to discuss a wide range of topics covering all that is subsea, with a focus on government and industry working in stride to mutual benefit. To start, can you share with the readers of MTR how you became involved in your chosen field? It’s funny because I come from a small town in Pennsylvania and as a kid we’d go to the shore. Growing up, my father had a family business, so when I went off to college I went into business. But when you get to college, you are exposed to a lot of things, and I came to find the oceans, estuaries, and streams really fascinating. It’s a very dynamic environment. I still got my business degree and then I went off and got a PhD in environmental chemistry. My background is unique because most people came up either through the sciences or policy. I find that the business has been tremendously helpful. If you can’t communicate your science, manage a budget, or lead people, it’s a really difficult way to go about doing any type of research. And I found that I didn’t have to divorce the two because I think the ocean is a business. It’s our business as a community. And it’s the blue technology. So I really find that those two combined – Oceans is *my* business. So you have a degree in business, a PhD in environmental chemistry, and now you’re in government. (laughs) And now I’m in the government. What drew you to government, or more specifically, NOAA? After coming out of academia, you are really groomed to stay in the academic institutions. I’m published, I was a basic researcher, and I wanted to go into the federal sector – particularly NOAA – to really learn about the mission-driven science, and how to make my science applicable to operations. And my goal was to stay for two years and then go back to academia; but I never left. I felt there was a need in the federal sector to have PhD scientists who understood and communicated the business aspect of science. From the job that you do here, how is it the same and how is it different from when you started? When I first got here, it was a hard transition from academia because the way the government talked about science was different than the way I was trained.. But once I figured that out, I really like it because the thing about NOAA science is that it is mission-driven. You get satisfaction in seeing the work we do helping people. So in academia, it was great because it’s exploratory, but I didn’t always see the end link to how it was being used by communities. Here we do every day; that’s the best part of the job. From the time you’ve been at NOAA, of which accomplishment are you most proud and why? There are two things. One is our response to (hurricane) Sandy. NOAA is very well-known for our weather forecasts, and supporting communities in preparation for an extreme event. I felt that through the work we did preparing before the storm, we were well positioned, ready to respond and then support recovery. So, I think orchestrating that – getting airplanes in the air, boats in the water – to do the hydrographic surveys, helping the Coast Guard to determine the re-opening up the port of New York/New Jersey. We surveyed 80% of the Port of New York/New Jersey as we positioned our vessels behind the storm, trailering them up from Florida, so they were ‘good to go’ when the skies cleared. We were well-prepared and positioned to support the coastal communities on the recovery. Very good. So that was number one. What was the second accomplishment? The second was prioritizing and coordinating the ocean and coastal portfolio of NOAA; most of that’s within the NOAA National Ocean Service. We had a diverse set of programs each with their own elevator speech, and when I came in as the head of that organization, I tried to bring them all together around some centralized themes. Coming out of that we as a team developed integrated priorities that truly enhanced our coastal and ocean services. We merged budget lines and shared resources which fostered coordination and partnerships across the organization. We also created one of the biggest coastal programs in the agency by merging programs together and getting people to work together. And what this does is it helps people on the ground; there’s less confusion. Now you’re dealing with a more integrated, holistic approach to coastal services, from observations and data to products and information central to coastal community decision-making. So I am very proud of helping to make us more streamlined in how we provide services on the ground, from an oceans and coastal perspective. Can you discuss the top three or four NOAA initiatives today, and the actions are being taken to implement these initiatives. NOAA has four priorities. The first is helping communities be more resilient. As you saw with (hurricanes) Katrina and Sandy, as well as the historic snowstorms, the recent droughts, mudslides and flooding, communities are becoming subject to more of these extreme events, but also chronic issues like sea-level rise. We are focusing our efforts to support communities with information, as my boss, Dr. Kathryn Sullivan, likes to call “environmental intelligence.” And that’s basically gathering the most accurate, best available information, and putting it in the hands of decision-makers so they can make informed decisions. What is a physical manifestation of “more information” in action? Let me give you an example. Ships come in and out of the Port of New York/New Jersey; thousands of them on an annual basis carrying tens of million metric tons of cargo. Businesses need to get their product from point A to point B, safely and on time. A product which is going to come off the boat, onto a rail, onto a truck, into WalMart in Iowa. All of this is very dependent on the intermodal transportation. There’s decisions being made every day on how to get a ship into port, safely and at the right time, taking into consideration wind, wave, water level and currents conditions. NOAA has a system that provides – every six minutes – real time oceanographic and atmospheric information to a pilot navigating into port. We are providing critical, accurate information so they can make decisions on how to safely navigate into port. So we have resilient communities. Next is evolving the weather service. People want information ‘now,’ and we are in a technology-driven world. It is amazing how far we have come; but we still have far to go. Over the next several years, NOAA National Weather Service will evolve its operations to build a nation where communities and our economy become ready, responsive and resilient to the increasing vulnerability to extreme weather, water, and climate events. We are still working to provide the best information, so evolving the weather service includes staying up with best technology, best models, best information, data and forecasts, and then giving that to the public. So when you look at technologies driving the ability to deliver that, what do you count as the key technologies? It is critical that the data and observations that we collect, and the models that we develop, are state-of-the-art. But also the way in which it is disseminated is critical. We work very closely with the newscasters and forecasters to ensure that that information is getting out in the appropriate way. The way scientists speak is not the way the public speaks, so we need to make sure it’s being translated in a way that people understand to take the appropriate actions. The next one is improving our observations, which is more than just satellites. We talk about modernizing all of our operations. This includes partnerships and collaborations with other agencies, with other industries, with other academic and research institutions. So we want to increase our observational capacity – it includes satellites, it includes ships, it includes buoys, gliders, land and ocean observation systems. That’s a big part of how we derive our models and our data that we provide the public, so that’s a very important foundation for us. The fourth priority is organizational excellence. All this depends on our people and people are the most important asset that we have at NOAA. Let’s talk about your observation capabilities and ships, ships which are big, expensive, and expensive to deploy. How do you see your observational techniques evolving in the coming 10 to 20 years? In the past, when science wasn’t as integrated as it is today, we had specific ships for specific activities. Now we’re moving to a multi-use platform that can integrate tasks; at the same time you’re gathering fish data, you’re using side scan sonar to gather bathemetry and hydrographic data. So integration of data collection is going to be key to maximize the resources we do have. I think you’re going to see more technology in gliders, unmanned aerial systems, unmanned underwater systems. We’re going to see crowd-sourcing. We’re going to see ships of opportunity, ships where we can place instruments for data collection. While the importance of unmanned systems will increase, ultimately I still think it’s critical to have people at sea; we can’t just go to satellites, we can’t just go to unmanned observations. So it sounds like NOAA is actively engaged in building partnerships among industry and academia. How do you see this relationship evolving for the greater good of all? And so the study – The Ocean Enterprise: A study of US business activity in ocean measurement, observation and forecasting – is trying to quantify the ocean enterprise; we are working with companies to ask, “You are a part of the ocean enterprise … where are you on this spectrum?” We are trying to figure out where those companies fall, as a provider or an intermediary, and to understand the scale and scope of business activity in ocean measurement, observation and forecasting. We are in the early phases right now, and we are actively getting companies to sign on. We have over 600 private sector firms already signed on, 83% self-identified as “providers.” I was just with the energy sector two days ago, and they want to know where to place their assets, they want to know about the security of their grids, and they want to know about the intermodal transportation moving energy from offshore to onshore and to market. The information that they want is not from the primary providers, but from the developers of information, the intermediaries that deliver a usable product. You’re getting all these companies together, everybody’s putting in information and input, and a study is going to come out. So what is the overarching value of that study? In some sense it is very basic to understand and quantify the ocean enterprise. What companies are actually playing in this arena? Who is focused on ocean activities from sensor development to application development? It is about bringing awareness, it is about understanding the value of the oceans overall. In one neat sentence, how would you summarize NOAA’s stance regarding engaging business, the private commercial community, in activities to mutual benefit? A good example would be ecological forecasting. We are gathering a lot of information on ecological forecasting and disseminating that to the broadest set of users. We’re not developing applications, but we are going to be gathering the relevant, timely and reliable information and putting it out there. Right now, we give it to emergency responders, we give it to decision makers, and coastal communities. If you were going to Miami this weekend, for example, wouldn’t you want to know if there was a harmful algae bloom? We are continuing to advance our observations and modeling capacity to get the best understanding of specific events. And it is even better having the private sector come in, grab that open access data and disseminate it. It would be great if you were going to Miami to not only check the weather but the water quality conditions and if any beaches were closed due to harmful algal blooms. The state of the industry: in overview, when you look out, what do you see? Science lets us know more about the oceans. In the past I think we looked at this as an infinite resource, but science has told us it is not. The oceans are finite. A year after the Japanese tsunami we were seeing marine debris wash up on U.S. and Canadian shorelines; it’s not that big of a world. When you look at the transportation industry, the ships are humongous. Look at the size of the Maersk Triple E class (containerships that measure four football fields long). The larger ships are coming to our shores, and I think as an industry we have to look at our physical and informational infrastructure and ask ‘are we ready?’ Do we have the physical infrastructure to handle larger vessels and do we have the ocean and coastal technology and observations to support coastal communities. How would you assess our current knowledge of the oceans, and what are the means to exponentially increase that knowledge? Yes, we know more than we did 10 or 15 years ago, but there’s still a lot more we need to know. I think the key thing to remember is that the oceans are a very dynamic environment, constantly changing and evolving. You don’t go out and measure the pH in a spot and then say ‘ah! We’re done! We know it!’ We work in a dynamic environment that’s changing all the time, so we need to adapt our observations and technology to the environment. We study a lot on the surface of the water, but I think there’s a big gap sub-surface. We saw that gap when we were looking at Deepwater Horizon (accident) and watching the way oil responds at all depths. Look also at the intensity of hurricanes. We’re putting out gliders in sub- to mid- water levels to see how that actually impacts trajectory and intensity of storms. Ocean acidification is another perfect example. We are working with the shellfish industry and hatcheries, and they want early warning systems to know when the pH can change dramatically, because then they need to buffer their waters or else their business is going to be in danger. So let’s turn our attention to your budget. I’m assuming that they’re not running to you with barrels of cash every year. What is the key to making progress in a tough budgetary environment? The budget varies. We have a large mission and a lot of requirements. And when bad things happen, like (hurricanes) Sandy and Katrina, the supplemental budgets help out to improve future forecasting. But I think the hardest part is always involving the science piece. When you’re fighting for your budgets, it’s easy to fight for the very linear; if you look at defense, I need X number of warships to protect X-area of coastline, for example; it’s understandable. When we look at ocean science … and we are tracking ocean acidification, or we’re tracking water quality, or we’re tracking sea level rise and inundation; and you’re not sure what the end result is going to be but you know it’s going to be significant in terms of protecting communities and making better decisions … it’s hard to sell that and to get the resources to do it. We are always tightening our belts, and we’re always trying to continue to evolve, and the resources. With that said, in my world, in the ocean service, we’ve seen, if you look at our budget’s tracking, we were down more than a hundred million dollars between 2008 and 2013. So I’m used to tightening my belt. How have we managed? We changed our philosophy, and we need to work together, we need to be integrated. And that is not just within ourselves, but it’s with the private sector, the public sector, the NGOs. Technology. Which ones do you personally find to be the most exciting, with the most potential to make your job and the job of your colleagues better. One of the things I think we’re going to see in new technology in the ocean industry is lower cost and higher efficiency. To give you an example, we’ve been measuring water levels for years using sensors in the water, measuring pressure change and looking at the changes of water level. Now we are going to microwave, moving towards an instrument that’s cheaper, that’s out of the water so it doesn’t require divers or the removal of bio-fouling. We also need systems and platforms that have capacity for multi-use. It can be the way we develop our buoy structure, to handle more instrumentations. We talked about diverse platforms. I think, in the future, it can’t just be all ships. It can’t just be all buoys. It can’t just be all automation or people; it has to be an integrated approach. And then, I think, we talked about crowd sourcing. For years we’ve been gathering data from the public and shippers on various items, from whale observations, to water temperature, to dangers and obstructions in the channel. And then in terms of information, I think improving our data access is critical from a federal perspective. We need to have open access-open data that allows industry to grab it, so it could be easily accessible and in a format that is downloadable for a multitude of uses. Every business, every position, has its challenges. What do you consider to be your greatest challenge? 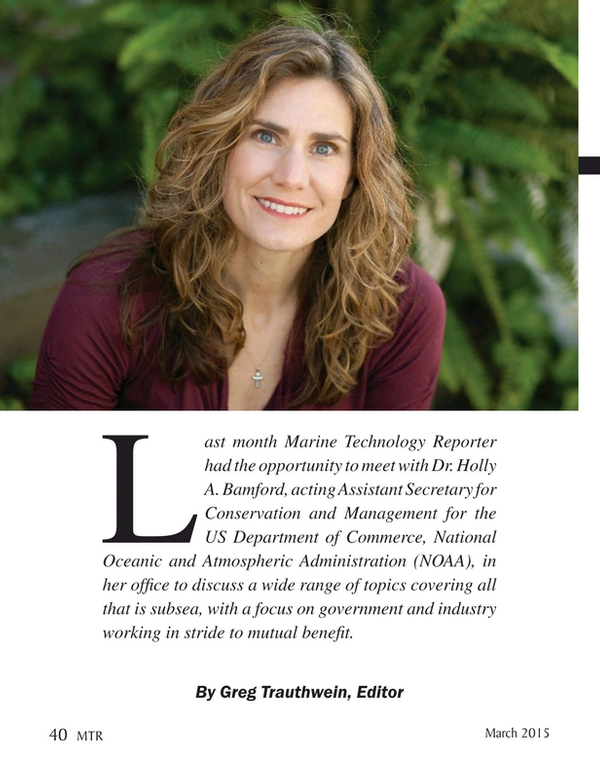 Dr. Holly A. Bamford is the acting Assistant Secretary for Conservation and Management for the US Department of Commerce, National Oceanic and Atmospheric Administration (NOAA). Dr. Bamford works closely with Congress, agency leaders, partner organizations, and local communities to develop policies and take conservation and community resiliency actions to ensure coastal and ocean stewardship and services. Previously, as Assistant Administrator for NOAA’s National Ocean Service (NOS), Dr. Bamford directed the federal agency that provides coastal and ocean science-based solutions to address evolving economic, environmental, and social pressures on our oceans and coasts. Prior to this appointment, she served as Deputy Assistant Administrator for NOS, where she managed the financial and business operations while strategically improving the agency’s performance to meet its vast ocean science and service missions. After Hurricane Sandy, Dr. Bamford was named the Incident Commander for NOAA responsible for all post response actions such as overseeing the agencies response to oil spill, chemical spills, marine debris impacts, hydrographic surveys to open critical navigation ways and ports, and high-resolution aerial imagery to map shoreline changes. Dr. Bamford earned a Ph.D. in the field of organic environmental chemistry, quantifying the physical and chemical processes that control the transport and fate of organic contaminants. She also spent a year as a guest researcher at the National Institute of Standards and Technology developing analytical methods to detect trace organic contaminants in water and air particles. Dr. Bamford over 20 publications that have been widely referenced in the field of environmental chemistry and water quality, including papers in Environmental Science & Technology, Atmospheric Environment, Marine Pollution Bulletin, and Environmental Toxicology & Chemistry. Dr. Bamford presented at a number of national and international meetings, academic institutions, as well as addressed the public through national media outlets including NBCNews with Lester Holt, CNN, ABC, NewsHour with Jim Lehrer, Good Morning America, Rolling Stone, People, and the Wall Street Journal.